This week we released a performance dashboard for the Environment Agency's waste carrier registration service. It's one of our 'exemplar' services, which we're making simpler, clearer and faster to use, and is currently in public beta. All businesses that buy, sell or transport waste must register as a waste carrier, broker or dealer, and the dashboard shows us how well the service is performing. We can see from the dashboard that nearly 15,000 businesses have registered since the service was released in December 2013, and about 95% of users choose to do this themselves online. The dashboard gives managers of the service useful information to help them improve its performance: what is the average cost per transaction? has the digital service been unavailable at any time this month? In the next few weeks we'll be adding new indicators that show user satisfaction levels, and the reasons people give for registering over the phone rather than online. 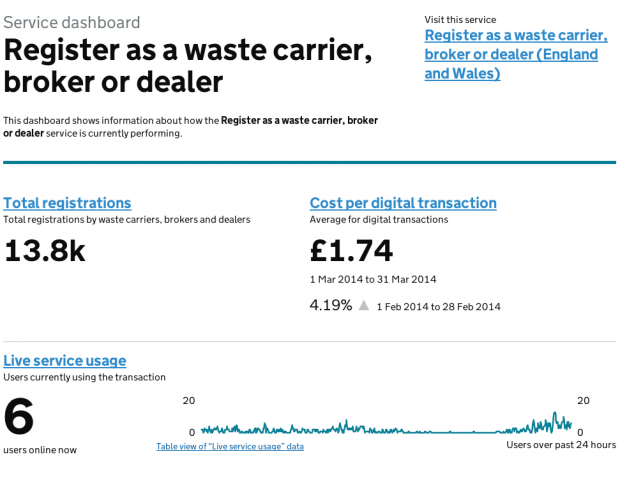 As with all our dashboards, we make data for the waste carriers service open to anyone who's interested. Take a look around 'Our performance' to see dashboards for other services. As a person who assisted in the registration of http://rubbishbegone.co.uk/domestic-services/house-clearance/ (just the technical part), I can say that the system is simply great. Saves so much time and the cost is very low. Thank you for making this a great experience for waste carrier businesses!